The generously oversized controls make the V3 Pro Series easy to spot. The “Pro” series of the Remington V3 semi-automatic shotgun was announced initially with the “Turkey Pro.” What you get as a matter of course with V3 Pro series shotguns are included shims, a redesigned receiver with easier loading, an extended bolt release, an over-sized charging handle, and a redesigned safety. Redesigned Loading Port for faster, easier loading. With the Waterfowl Pro Remington has sought to give duck hunters the features they want the most, straight out of the box, at what I feel is a bargain price. MSRP for any of the three Waterfowl Pro models is $1195, putting street price right at, or perhaps just under a thousand clams. For example, a 3 inch Browning Maxus “Wicked Wing” is $1779.95 MSRP, the Benelli M2 Performance Shop M2 Waterfowl Edition is $2699 MSRP, and so it goes. Yet, the Remington V3 is softer-shooting than all of them, with the best factory trigger in an autoloading hunting shotgun on the market. Remington also has the best warranty, by far: a Lifetime Written Warranty as compared to no warranty with the Browning and the ten-year warranty with Benelli. Based on my experience with the V3 Turkey Pro, I can tell you that Remington did an outstanding job on the bolt release. I've never had any trouble with the standard Remington V3 shotguns, but this is an example of Vince and Remington engineering continually adding refinements and incremental improvements even though they are hardly strictly necessary. It is very good to see and refreshing to see as too many models seem to go into a coma of sorts after they are initially released. The good news for the many current V3 owners is that shims, the extended bolt handle, and the larger bolt release are all available to you from Remington, if you want them. Getting a Cerakoted shotgun straight from the factory is great news for a lot of folks. For example, a good Cerakote applicator is Midwest Gun Works. They charge $70 for dis-assembly / reassembly, $75 for the barrel, and $75 for the receiver (or, $295 for the complete firearm). Plus, someone is going to pay for shipping to and from Midwest. Midwest is hardly the most expensive applicator out there, so it is an excellent value for the consumer to have it all right in the factory box. I'm not the guy to drag shotguns over gravel or leave them out in the weather for a year, so when it comes to abrasion testing, burying guns in dirt, or hosing them with a five percent salt solution: I'm just not that guy. Nevertheless, although all finishes wear, Cerakote is comparatively thick and lasts a very long time on a long gun where constant holstering is not a factor. Remington offers both Burnt Bronze and Patriot Brown Cerakote. I personally prefer the more muted Patriot Brown for a hunting gun, but that's why they call them choices. I've long felt that the Remington V3 is the best all-around hunting autoloader Remington has ever made . . . I still feel that way, and with the Waterfowl Pro, a great gun just got greater. The only question most people have is, “when can I get mine?” I'm guessing that the Remington V3 Waterfowl Pro will be in distribution across the United States sometime in May or June . . . long before the 2019 hunting seasons kick in. 2019 looks to be a very good year for the V3 and perhaps not-so-good of a year if you are a mallard. 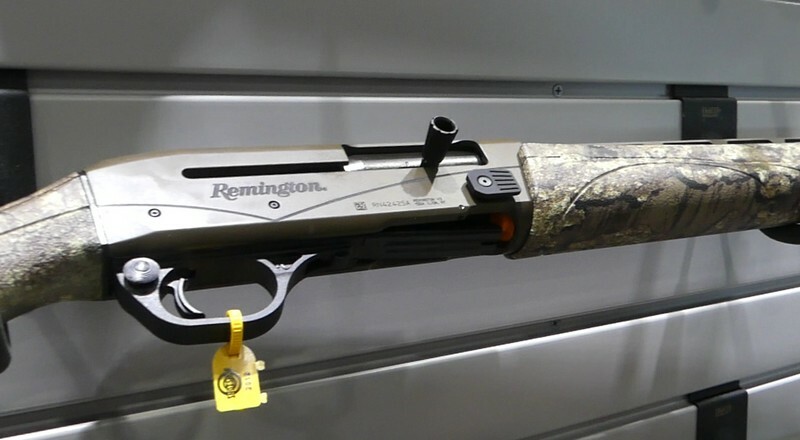 I like what Remington has done with the V3 Waterfowl Pro and so will most everyone. It is more than anyone needs to take most anything that flies, with an outstanding trigger, low recoil, and generous controls all included.